Background photo by Arturo de Frias Marques. The government and treasury of the Falkland Islands have issued (20th August) the second release in their current series of coins featuring these quirky and endearing flightless birds that have made much of the South Atlantic their home. The Falkland Islands have become known as the penguin capital of the world, and it is a distinction heartily deserved. It was once difficult to believe that these beautiful birds were victimised for oil, and, in the case of some breeds, for their beautiful skin. Thankfully, conservation and awareness have changed this and the penguins are now a favourite with tourists, which has most likely saved them from further exploitation, and, in many cases — extinction. 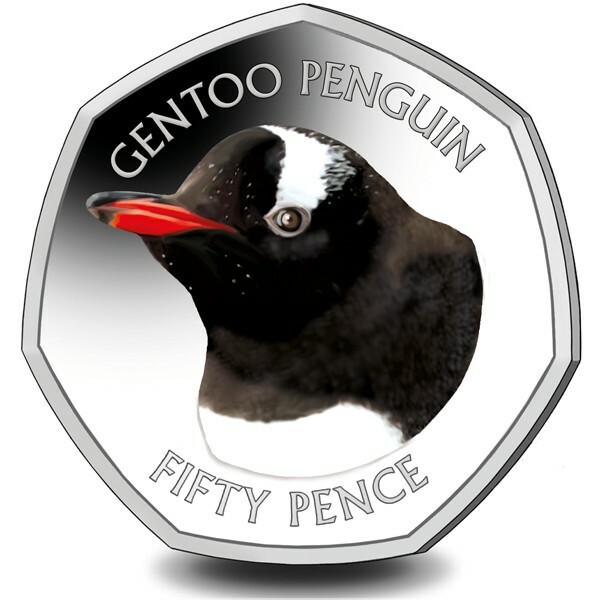 The second coin’s design features the gentoo breed, which is the most widely occurring penguin, and it is noteworthy to point out that the Falkland Islands are home to the largest population of this species of penguins on Earth. Gentoo penguins are a long-tailed species of penguins first described by science in 1781 on the Falkland Islands by naturalist Johann Reinhold Forster, who travelled the world with Captain James Cook. They are distinct in terms of their recognisability since they have vivid red markings which are seen on their beak and white bar markings on their forehead. The coins are produced by the Pobjoy Mint at their facilities in Surrey on behalf of the treasury of the Falkland Islands. The reverse features a “head shot” of a gentoo penguin, which is shown in glorious colour and features the unmistakable white bar over the crown on the head of this particular breed. The obverse of the coin features an effigy of Her Majesty Queen Elizabeth II, which is an exclusive design from the Pobjoy Mint. 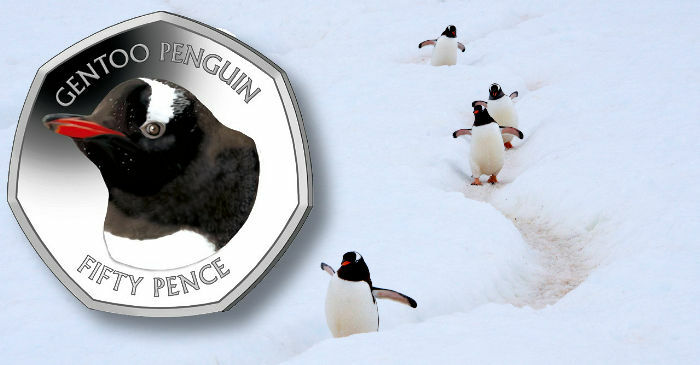 The seven-sided 50-pence coin series follows a similar penguin-themed four-coin series launched last year, whose coins sold out within a matter of weeks with each release. This year’s series features five additional breeds of penguin that are resident on the islands at some point during the course of the year. The second of the five-coin set is due for delivery on the 3rd September, with pre-issue orders being accepted. 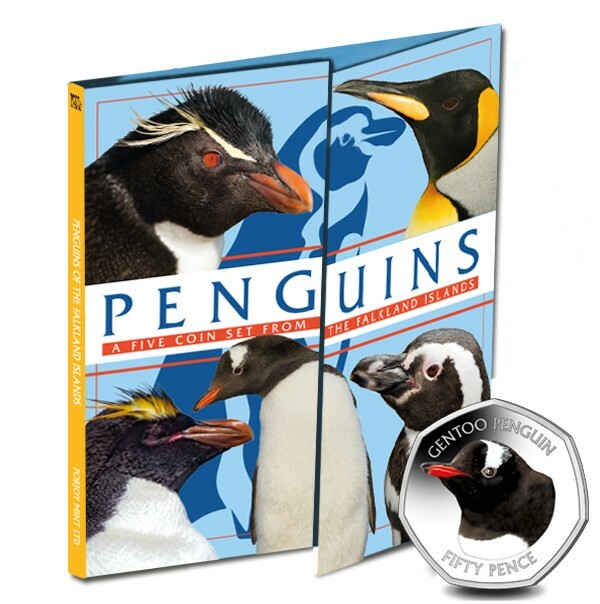 A new collector’s album to hold the new series of five coins is set against a beautiful image of a group of penguins, which also includes information on each breed and gives important facts about the individual penguins. Additional breeds of penguins included for the 2018-dated series will be the king, Magellanic, and southern rockhopper. 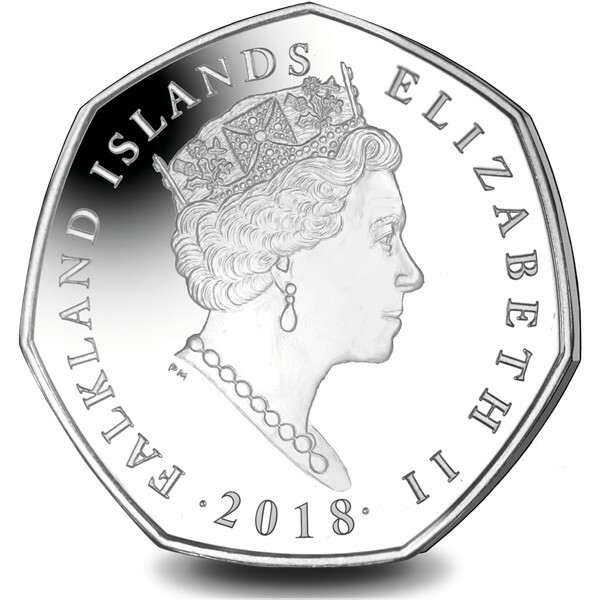 For more information about this coin and others issued by the treasury of the Falkland Islands government, please visit the website of the Pobjoy Mint.